It all started simply enough. Logical enough. If they are arranged in a linear system, we can drop a white tea and add a black one, and everything fits fine. But that led us to a much deeper discussion. Do our groupings make sense? The old back bar had teas arranged by style. All of the green teas were together, including the dragonwell, sencha, raspberry hibiscus green, Moroccan mint, and jasmine green. But that’s not how people select a tea. That’s not how we select a tea. When a customer comes in that doesn’t know what he wants, we go through a decision tree. We start with, “do you prefer straight tea, or something flavored?” If they choose straight tea, we ask if they like white, yellow, green, oolong, black, or pu-erh. If they choose flavored, we ask if they want something fruity, flowery, spicy, creamy, or minty. So why not set up the shelves that way? Very few of the people asking for a berry tea care whether the base tea is green, black, or oolong. They just want a berry flavor. It makes more sense to put all of our huckleberry teas together instead of having one with the black teas, one with the rooibos, and one with the yerba maté. 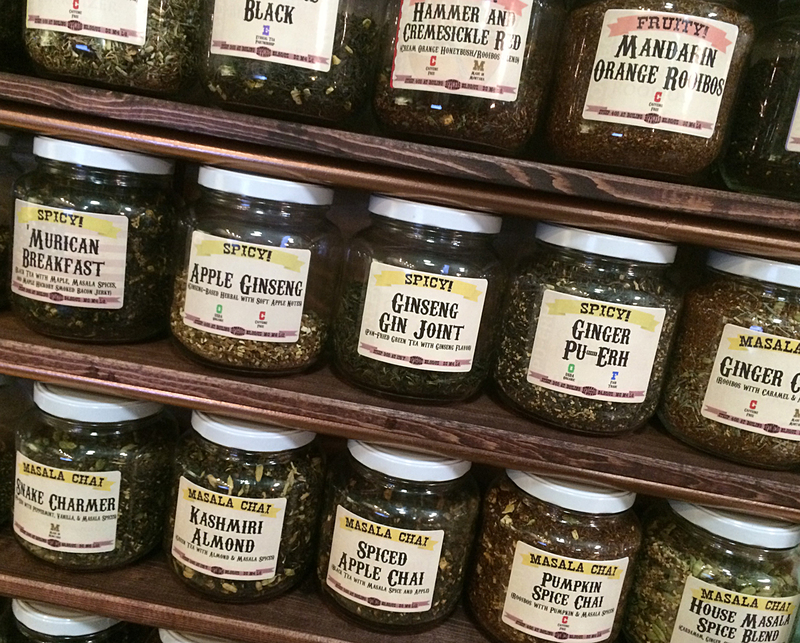 The new structure puts all of the straight tea and herbs on the right, and all of the flavored blends on the left. Posing in the front is our tea plant, Tea H. White. We went through our stock and found that if we grouped the herbs and tisanes (e.g., rooibos, yerba maté, guayusa…) with the straight tea, very close to half of our blends were flavored. So we arranged everything so that if someone says they’re looking for straight tea we take them to one side of the bar, and if they’re looking for something flavored, we go to the other. 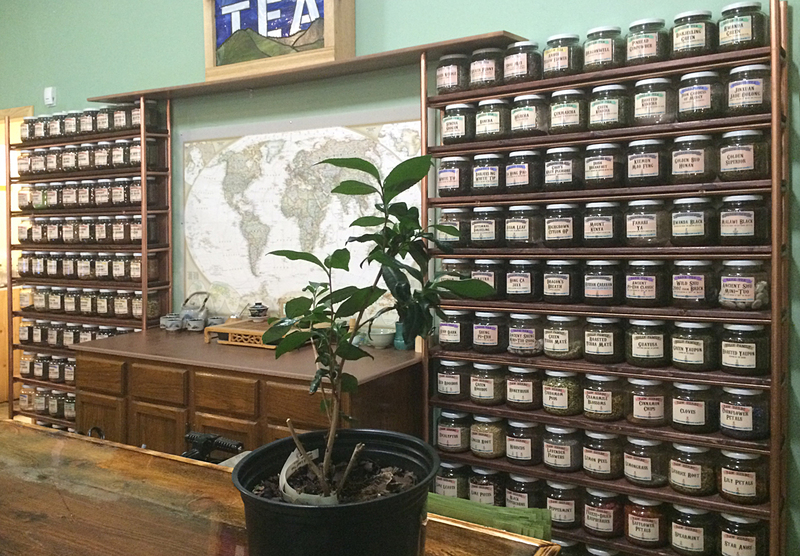 Having an organization that customers can follow makes it less intimidating for people new to the tea world. Within each style, the tea is arranged by origin, with blends coming first. In the picture above, you can see the black breakfast blends, and jars of black tea from China, Sri Lanka, Kenya, Rwanda, and Malawi. 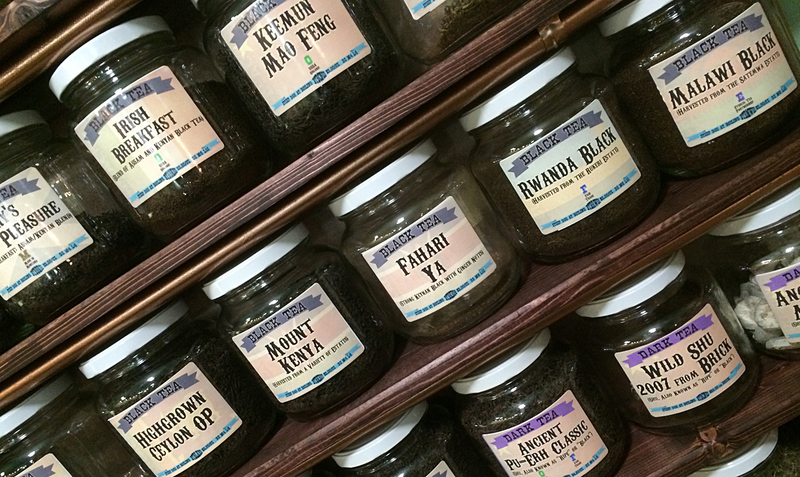 Most of our customers aren’t used to thinking about tea origins, and they’re intrigued by the diversity of sources. “Where do you get your tea?” is one of the most common questions we get. It’s kind of difficult to answer. We deal with quite a few importers and distributors, but we also like to buy direct from estates and farms when we can; it helps us to be sure of what we’re getting. 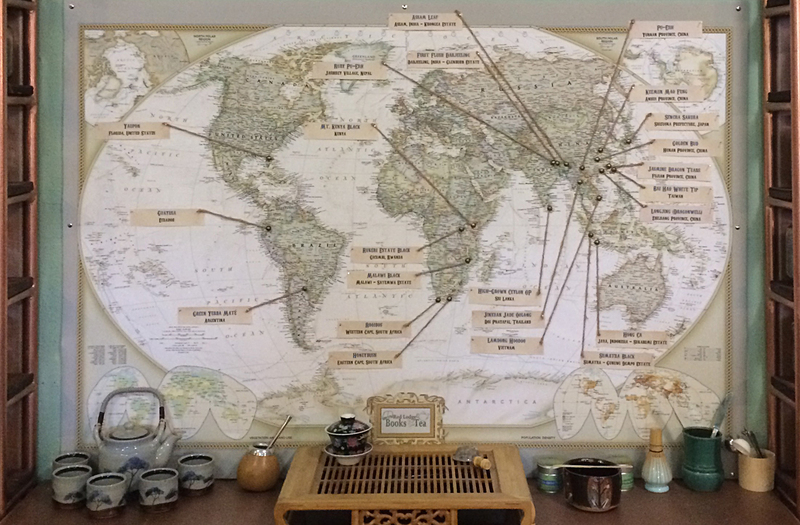 To answer the question, we included estate names on the labels where we can, and made a map to put between the two blocks of tea shelves. We’ve had very positive reactions to the map. People say, “I’ve never had a tea from Vietnam. I want to try that one!” Sales of some of more obscure tea are increasing, and people seem to be enjoying comparing tea from different parts of the world. It’s a great way to learn about terroir and regional differences in processing techniques. When we move over to the flavored side, priorities are different. Few people care about the origins, and virtually all of them are blended from geographically-diverse ingredients. We couldn’t organize those by origin if we wanted to. On that side, we start with fruity teas at the top, grouping all of the berry together, the citrus together, and so forth. We then proceed down through the spicy teas (with masala chai getting its own section), flowery teas, Earl Greys, mint teas, and on through the flavor profiles. Since caffeine isn’t taken into consideration in the sorting of the flavored teas, we put codes on the labels to help people find what they want: a green O for organic, blue F for fair trade, red C for caffeine-free, brown M for “made in Montana” (mostly our house blends), and purple E for Ethical Tea Partnership. Is this the perfect organization for every tea shop? Of course not. An herbalist might want to group the teas and herbs by reputed health effects, or by Linnaean classification of the plants. A tea house focused on food might group them by the foods they pair well with. A café focused on tea by the cup rather than bulk sales might group their tea based on what’s best hot, what’s best iced, what works well in a latte, and so forth. While writing this blog post, I was drinking Lamdong Hoodoo, a Vietnamese black tea. Since I don’t take milk or sugar in my tea, I prefer black teas with low astringency, but I still like plenty of flavor. This one definitely fits the bill. A nice spicy flavor and aroma, but no bitterness. I steep it for 2:30. Posted on 31 December 2014, in Tea Biz and tagged caffeine content in tea, Camellia sinensis, designing a tea bar, ethical tea partnership, fair trade, flavored tea, guayusa, Lamdong Hoodoo, Linnaean classification, masala chai, organic, organizing a tea shop, organizing tea, oxidation level of tea, tea bar, tea map, tea origins, tea sourcing, Vietnamese tea, yaupon. Bookmark the permalink. 2 Comments. While I’m still a bit of a traditionalist in keeping the blacks, oolongs, and whites, etc. as their own simple categories, the new layout looks nice. Can’t wait to see it again in person. I’m still a bit of a traditionalist that way, too, Geoff. But moving the flavored black teas away from the straight black teas gives me the flexibility to do cross-style flavored blends. Before the redesign, I don’t know where I’d have put a lemon blend containing both black and pu-erh teas, or a floral blend with both green and white teas.